In today’s doomsday world, I have a profoundly simple message of hope for the youth facing the future. That we are destabilized climate is becoming ever more obvious because of increasingly extreme and violent weather. This unnatural and accelerating change in an increasingly destabilized climate, brought about by the actions of humankind, will have consequences for future generations beyond our imagination today. It is simply not possible to measure such consequences in monetary terms or human suffering and lives lost. While many adults are in denial, the youth of today facing the inevitable collapse of cities with violence difficult to even imagine, are not. Human climate change we cannot address as individuals. 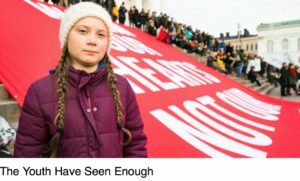 We can only do so through our institutions – governments, universities, environmental, international organizations, etcetera Facing dangers worse than all wars ever fought, the failure to take action is of such concern that children, fearing for their future, are walking out of schools rebelling and demanding action as did Swedish 15 year old Greta Thunberg at COP24. 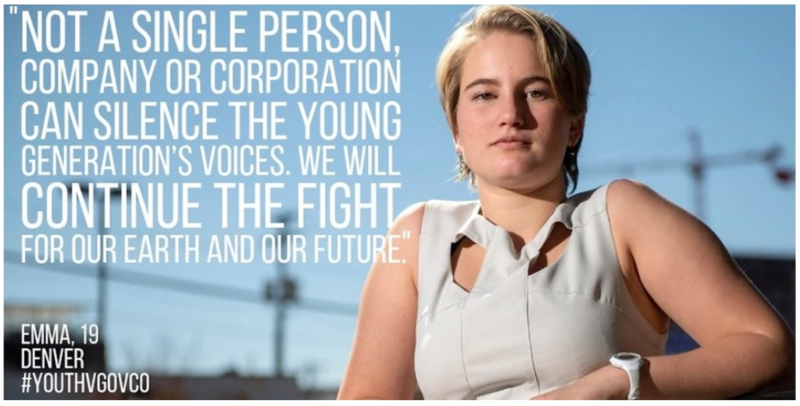 Young people are right to demand action on two, interconnected, fronts: environmental destruction due to global desertification and agriculture, leading to destabilizing the climate, and the rapid burning of fossil fuels exacerbating climate change. I once heard a fellow scientist Elisabet Sahtouris state that if we had viewed our Earth from space over the last fifty thousand years we would describe humans as a desert-making species. Many issues society is today attributing to climate change are simply symptoms of global desertification caused by humans as I described in a 2013 TED Talk not disputed by any knowledgeable scientist – increasing frequency and severity of both drought and flood, poverty, social breakdown, mass emigration to cities and across borders (Europe and America), mega-fires, conflict, violence and war as well as climate change. Unfortunately most people, given our mechanistic world-view, fail to understand that desertification, mega-fires, warming oceans and climate change are now operating in Nature’s feedback loops – feeding on one another. What action should young people demand as they fear for their future? Unless the youth of today have new ideas, they can only demand more rapid action on the measures proposed by our institutions, billionaires and other celebrities – Stop using fossil fuels and make electricity from environmentally benign sources of energy, eat less meat, invest in factory production of artificial meat, use technology and energy to geoengineer our climate by making biochar, plant trees, develop swales to harvest runoff water – and as these fail consider further climate geoengineering by discharge chemicals into the atmosphere. Let’s come down to Earth and old fashioned common sense! To solve any problem common sense informs us that it is essential to address the cause of the problem. If we do not address the cause of desertification and climate change we can guarantee failure. Thankfully almost all of society and our brightest institutional minds know what is causing both desertification and climate change – and that is livestock, coal and oil. However, as I said in my TED Talk explaining global desertification blamed on livestock – “We were once equally certain that the world was flat. We were wrong then and we are wrong again”. And now I would say the same thing about the certainty that livestock, coal and oil are causing climate change. Once more, we are wrong despite our certainty, as is easily explained to any teenage child. 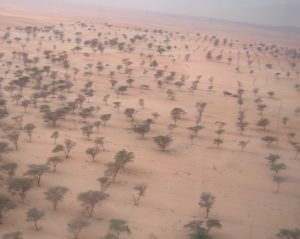 What is really causing both global desertification and climate change? Livestock are a resource needed for centuries to come to feed and clothe people. Coal and oil are fossil resources with large carbon molecules needed to produce many products in the future. And no resource can cause a problem. This bears repeating. No resource can cause a problem because it is how we manage resources that leads to any problems. It is how we manage livestock, land and wildlife that causes desertification of the world’s seasonally arid regions, with high or low rainfall, that constitute about two-thirds of our planet’s land mass – and here we began causing desertification over 50,000 years ago. It is management that calls fossil resources “fossil fuels” and burns them at a damaging rate adding greenhouse gases to our atmosphere accelerating climate change. With 100% certainty it is management causing global desertification and climate change and all the many symptoms. When our experts and authorities inform us that climate change is caused by livestock, coal and oil, this is “proof by authority” not science. Science as we know from history is more than experimental design, proof by authority academic behaviour and peer-reviewed publications. Science originated long before the word was coined ,to describe what earlier people did in developing all of the many domesticated plants and animals, that made civilization possible, from observation, deduction, logic and discussion around camp fires and later kitchen tables. I have been engaged with my mentors and fellow scientists, often round my camp fire, over more than sixty years trying to solve the riddle of why we could put a man on the moon, but are incapable of the management of complexity on Earth. If, as I believe we must, we accept that it is management causing desertification and climate change, then redoubling our efforts on the measures above that address symptoms of desertification/mega-fire/climate destabilization feedback loops, we guarantee suffering beyond imagination for future generations. Accordingly, it is important that young climate rebels represented by people like Greta Thunberg, or even AOC as she is becoming known in the US Congress, be better informed. There can only be real hope for the future if the action demanded is to change our management, including policy development and international development projects such as the UN Sustainable Development Goals (SDGs). I believe the logic unarguable that demanding action – that does not address the cause of either desertification or climate change – can only result in continued destabilizing of our climate, ever more violent weather, rising seas, expanding deserts, social breakdown, violence, religious conflict, emigration across borders all culminating in the globl collapse of civilization as we know it. On the other hand, a demand for our institutions to change management and thus address the cause of desertification and climate change, offers hope. What is it about management that results in causing desertification and climate change? We are in the early stages of the second major paradigm shift in history. Like goldfish in a bowl we cannot see the bowl. The first major shift in world view was from a flat world with the sun going around us, to a round world orbiting a stationary sun. Now we are shifting gradually from centuries of mechanistic worldview to a holistic worldview. Forty years ago, helped by many people on four continents, I discovered almost accidentally that management is, and always has been, mechanistic and what we today call reductionist. And that is was our reductionist management causing almost all that ails us. With that discovery we also discovered how, with minor changes we could manage holistically in all walks of life from household to governance and beyond. Let me explain simply. Everything we do not manage in our material lives is something we “make.”And everything, without exception, that we make – from a toothbrush to space exploration vehicles, or electricity from solar, wind or any other source – stops working if a part breaks, fuel runs out, a battery goes flat. This is because nothing we make is self-organising. In systems science everything we make including space exploration vehicles is defined as a complicated system. Another feature of all we make is that problems are relatively easy to solve given money and time. On the other hand, everything that we manage is self-organizing in that things continue to function, albeit in changed form, if people die or some species die out. Being self-organizing everything we manage is defined as complex as opposed to complicated. This self-organizing complexity we see from our families to governance, farms, ranches, forests, fisheries, churches, religious organizations to vast international organizations and corporations. This complexity we have always to deal with in management involves an inescapable web of social, cultural, environmental and economic complexity. Ultimately, if you think deeply, we manage with the aim of improving our lives. Another feature about managing complexity is that problems which occur are extremely difficult to solve. We call them wicked problems. We don’t yet have a cure for the common cold, and it took over ten thousand years to solve the riddle of seemingly inevitable desertification, no matter what humans did to avoid it. Together, nature and organizations, constitute everything humans manage, from our families to governance, with minor exceptions. Management involves complexity, and it is our inability to manage complexity that is the cause of desertification and climate change, and most that ails us. Rebecca Costa who wrote The Watchman’s Rattle: A Radical New Theory of Collapse, concluded past civilizations failed because they could not address the complexity of rising population and deteriorating environment. They turned away from seeking knowledge, their equivalent of science, to religion and sacrifice – while shelving the problems for future generations. There are similarities with global civilization today in such behaviour except that future generations are rebelling and demanding action rather than allowing adults to shelve the problems for them to deal with. We take trillions of actions daily all over the world to achieve a great many objectives. These trillions of actions can be lumped under three main headings as the reason, or context, for our actions –to meet a need, meet a desire, or solve a problem. To take any action beyond thought or theory we have to use a tool (tool-using animal) as we see even if wanting to drink water today. Unless we go to the nearest river and drink with our mouths, we cannot drink water without using technology (pipe, pump, cup, dam, etc.) So we determine an action and it involves use of a tool to meet a need, desire or solve a problem. And then we make that decision always on one or more of many factors –past experience, expert opinion, research results, cultural norms, tradition, beliefs, cost, cash flow, profitability, expediency, friend’s advice, peer pressure, advertising, etcetera.) So let’s begin looking at all the tools we have in every profession in the world with which to manage our environment. When society, and my fellow scientists, believe we have a great many tools and thus options, you might wonder at how I arrive at only three. I did this while commissioned by the U.S, government to train 2,000 professional people over two years in the use of the Holistic Management framework during the early 1980s. I had participants list every tool they had ever used, or been taught to use in any university in any profession, in their private or professional lives. That resulted in long lists of things that were all technology in its many forms. Apart from technology the only other tools any profession had ever used was fire or the action of resting the environment. Some mentioned planting trees, which like drinking water, we cannot do without the tool of technology. So this became the only other possibility known – using technology to plant trees to address desertification and now climate change – which has been done for 9ver 2,000 years without success, and is now being advocated widely as though new thinking (even winning a Nobel Prize). $30 Billion planting trees in UAE with desert sands marching on. I will return to the tools because there is no tool here that could either prevent or ever reverse global desertification. So, leaving aside the tools let’s see why we call management with this framework reductionist. Everything we manage (organizations and nature remember) involves a web or social, cultural, economic and environmental complexity that is unavoidable. When we reduce this web of complexity to meeting our needs, desires, or solving problems as the reason, or context, for our management actions that is best described as reductionist. Think of it like this. If I say I have decided to light a fire (action) you would have no idea whether is should or not until you asked me why (my context for this action). If to cook our food in a safe fire place, fine. If simply lighting it on the floor to get warm it could burn the place down. In the complex, holistic, real world any action to simply meet a need, desire or solve a problem is too simplistic for the unavoidable web of complexity -social, cultural, economic and environmental. It is almost like lighting fires with no reason – and leads frequently to unintended consequences. Policy development is an aspect of management that is reductionist even where the most sophisticated interdisciplinary teams of scientists develop policy. In such cases where every scientist is aware there will be social, environmental and economic consequences and the disciplines in the team cover all of these fiefdoms, the web of complexity is consistently reduced to the problem addressed, as the context for policy actions. The result, as we see for example with policies of the U.S. on drugs, noxious plants, terror, or immigration is that the problems increase and lead to unintended consequences. The large sample of 2,000 US government, university and World Bank officials training to use the holistic framework analysed hundreds of their own policies. They concluded every policy analysed would fail and lead to unintended consequences. So common is this that economists refer humorously to the Law of Unintended Consequences. Returning to our three tools. Global desertification, and thus destabilization of our climate was inevitable simply because we lacked any tool to prevent this happening, from the time we acquired fire, spear and language (enabling organized hunting by an omnivorous scavenger – something the world had never seen). 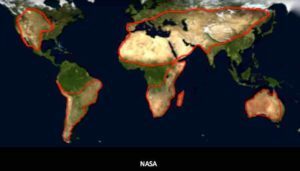 As I explained in my earlier 2013 TED Talk, two of our tools – fire and resting the environment lead to non-effective rainfall and thus desertification over about two thirds of Earth’s land area. And the tool of technology can never even in our imagination replace gradual chemical breakdown of annually dying vegetation in such environments with the needed rapid biological breakdown that only large grazing animals can do.Large grazing animals that we mostly wiped out and replaced with few domesticated animals and fire progressively during the last 100,000 years or so. What is the Holistic Management framework that offers all of humanity hope? When managing holistically we still take actions to improve our lives as before to achieve needs, desires and address problems. However, instead of reducing the web of complexity to such a simple context, we use a pre-determined single over-arching holistic context to guide management in any situation. And we add livestock as a fourth tool to our toolbox so that we can begin to reverse desertification and develop truly regenerative agriculture based on the biological sciences. Holistic Management is faster, easier, less risky, more harmonious, uses all available scientific knowledge as well as other sources of knowledge, and most of all reverses desertification and begins to seriously address climate change. People, as we have experienced, can learn how to make management decisions holistically in a week. Having trained many thousands of people in all walks of life – from semi-literate herders to university professors – I have never found ignorance block learning. What does, I find always block learning, is our egos or what we already know. So thankfully young people with no formal training in mainstream agriculture, wildlife, forestry, fisheries, ranching, pastoralism, policy development, etc., and not having yet based their self-esteem on their expertise are like sponges absorbing new counter-intuitive or paradigm-shifting knowledge such as learning to manage holistically. The first step in Holistic Management is to clearly determine what exactly is being managed and by whom and for whom. This we call establishing the Whole under management and we do this both because everything in nature operates in such wholes, and we need to determine who it is that develops the essential holistic context to guide the management or policy. We want stable families, living peaceful lives, in prosperity and physical security, while free to pursue our own spiritual or religious beliefs. We want adequate, nutritious food and clean water. We want good education and health, in balanced lives, with time for family, friends and community and leisure for cultural and other pursuits. All to be ensured, for many generations to come, on a foundation of ethical and humane behaviour to all life, regenerating soils and biologically diverse communities on Earth’s land and in her rivers, lakes and oceans. Some whole situations require what we call a real holistic context – developed by the people involved in the management. Some require a generic holistic context because the millions of people affected cannot together develop the holistic context needed for good governance – the main role of government is developing policies (from which flow laws and regulations that today are leading to unintended consequences because of public frustration in many nations) With either a real holistic context or generic holistic context depending on circumstances, we then go about business pretty much as before – we still have goals to achieve to meet our needs, desires, solve problems, etc. Because of the unintended consequence of management by academically highly, but narrowly trained people, we now open our minds to all established scientific principles, science as well as traditional knowledge as we manage beyond the narrow fiefdoms of expert advice in an entirely non-disciplinary manner. When deciding on any action to use any tool we still go through all the normal considerations as we have always done – past experience, research, expert opinion, cost, etc. Making management decisions in this way becomes easier because most people intuitively know if what they are considering is in line with their holistic context. However, when there is any doubt we use seven filtering questions that help us ensure that the management of our lives, businesses, policies, etc. are in line with the holistic context, while meeting needs, desires or solving problems. Apart from actually making management decisions in this holistic manner, there is one other essential step and that is adding one more tool to our small tool box. The missing tool – livestock. The tool that is missing – as I described in my TED Talk and in great detail in the textbook Holistic Management: A Commonsense Revolution to Restore Our Environment. Island Press 2016 – is livestock. During all my earlier work striving to first understand, then remedy desertification in the 1950s and 60s I was influenced by my education and societal beliefs and thus vilified livestock for causing desertification. In 1957 I coined the words “game ranching” trying to give wildlife a value so that we could get rid of livestock and reverse the land degradation. It was humiliating to find, from my observations in the field first, that I was wrong and have to back down and swallow all my words in public. It was a turning point in my life to suddenly understand that we scientists had no option but to learn how to manage livestock to mimic herds of old taken to extinction thousands of years ago. Unfortunately it was not only me as a fanatical young scientist trying to save wildlife, who hated livestock. Ancient texts, I am told, blame livestock for causing the deserts of biblical antiquity. It is important to understand, that it was my conclusion that only livestock properly managed could save civilization as we know it, and not Holistic Management itself, that led to half a century of institutional resistance, ridicule and abuse. And it is largely institutional vilification of livestock that underlies the media and celebrity vegan, artificial meat drive today. Tragically this public perception of livestock has drowned the very idea of Holistic Management providing a way of managing complexity, something no scientist or institution has opposed.